Welcome to the site of the Wave Engineering Laboratory, a part of the Center for Nonlinear Studies in Institute of Cybernetics, Tallinn University of Technology. The laboratory was formed on 01.01.2009 to promote and provide a structure for research in water waves and coastal engineering within the Department of Mechanics and Applied Mathematics, Institute of Cybernetics and now is one of the core labs of the Institute of Cybernetics. The laboratory currently comprises one leading scientist, one senior scientist, five scientists with PhD and three PhD students. The team focuses on complex and nonlinear phenomena in wave dynamics and coastal engineering, and the applications of mathematical methods in wave studies. The scope of research involves, but is not limited to, long wave theory and applications (with emphasize on fast-ferry waves, shallow-water solitons, set-up and run-up phenomena, tsunami research, and generic aspects of coastal hazards), surface wave modelling, wave climate studies, and wave-driven phenomena in coastal engineering, with application to integrated coastal zone management. Rapidly emerging new foci are the use of Lagrangian transport of different substances in marine environment for marine and maritime spatial planning, adequate description of hydrodynamic (wave and water level) extremes, and preventive methods for mitigation of marine-induced hazards. Tarmo Soomere was elected foreign member of the Latvian Academy of Sciences (26.12.2015) and honorary member of the Estonian Scientific Society in Sweden (09.02.2017). Bert Viikmäe received III prize in the national students research competition in the doctoral students category (18.12.2014). Bert Viikmäe was awarded a Young Scientist Scholarship by the Estonian Academy of Sciences’ Foundation (14.12.2014). The Estonian Academy of Sciences has elected Tarmo Soomere to be the President of the Academy for the next five years (15.10.2014). Andrea Giudici received the best students’ presentation award from the 2nd International Conference Climate Change – The environmental and socio–economic response in the southern Baltic region (Szczecin, Poland, 12–15 May 2014) for his presentation Highly persisting patch formation areas in the Gulf of Finland, the Baltic Sea. Tarmo Soomere received the state decoration from the President Estonia: III class Order of the White Star (23 February 2014). 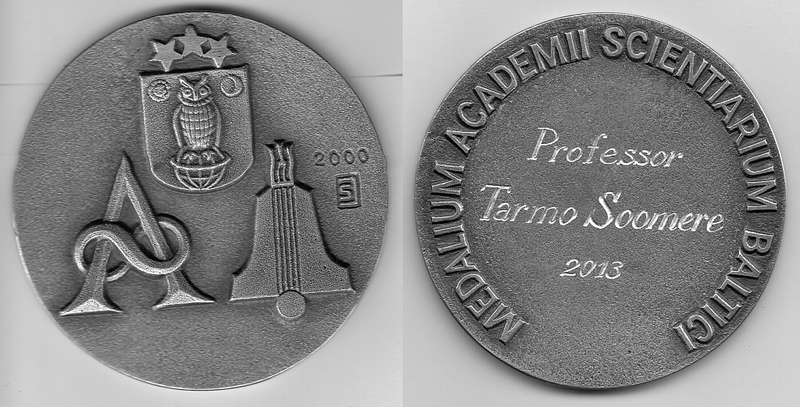 Medal of the Baltic Academies of Sciences was awarded to Tarmo Soomere for outstanding results in research cooperation between Estonia, Latvia and Lithuania in marine sciences (29 January 2013, the medal). Master thesis of Rain Männikus “Improving breakwater configuration in Noblessner Port against wind waves and vessel wakes” won II prize at the state competition of students’ research work (2012). Tarmo Soomere has been elected the Scientist of the Year (2011) of the Tallinn University of Technology (January 2012). Tarmo Soomere received the title of the best scientist, journalist or teacher that communicates science and technology in Estonia (2011). Master thesis of Olga Tribštok “Comparison of wave regimes along Estonian and Lithuanian coasts” won a prize at Estonian Academy’s of Sciences student research award competition (2011). Ira Didenkulova has been elected the Best Young Researcher of the Year (2010) of the Tallinn University of Technology. 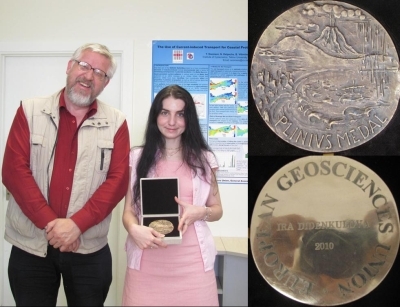 Ira Didenkulova has been awarded the Plinius Medal by the European Geosciences Union (2010). Master thesis of Inga Zaitseva-Pärnaste “Long-term variations of wave fields in the Estonian coastal waters” (June 2009) won the II prize of the national competition of student’s scientific work by the Estonian Academy of Sciences (2009). Wave-driven phenomena in coastal engineering, with applications to integrated coastal zone management.